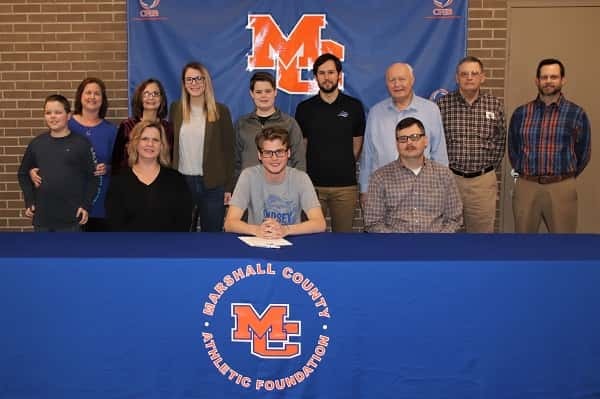 Grant Wilson signed with Lindsey Wilson College Cycling Thursday joined by his parents (seated) Molly Wilson and Jeremiah Wilson and standing Meagan (Wilson) Mathis, Gavin Wilson and Lindsey Wilson Head Coach Josh Patton. 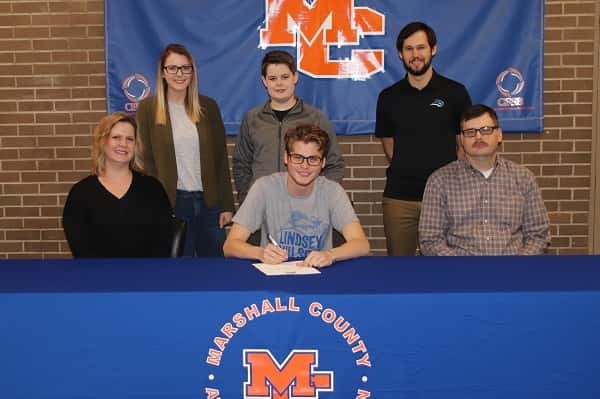 Grant Wilson signed Thursday at Marshall County High School to further his cycling career and education at Lindsey Wilson College in Columbia, Ky. The Blue Raiders race in the Southeastern Collegiate Cycling Conference (SECCC). Grant has been a member of the six-time state champion Marshall County Mountain Bike Team the past four years. 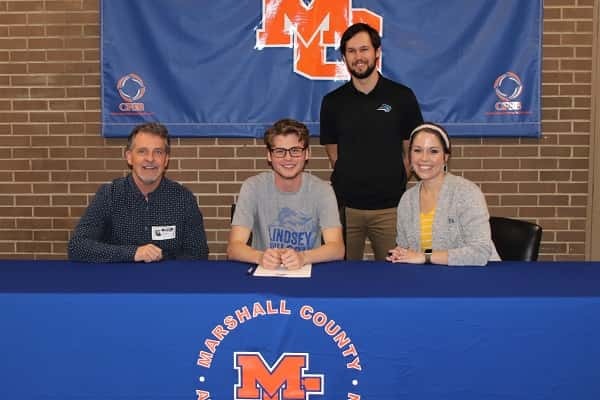 As part of the National Interscholastic Cycling League (NICA), he won the JV state championship race and overall state champion title his sophomore season and this past season won the Varsity state championship race in the Tennessee High School Cycling League. In 2016, Grant was the recipient of NICA’s Specialized Student Athlete Leadership Award. Grant also races in local, regional and national events and has competed in over 25 USA Cycling events across the United States, landing on the podium in many of them. He holds several state titles and top 10 finishes at USA Cycling National Championships. Grant plans to pursue a degree in mathematics. 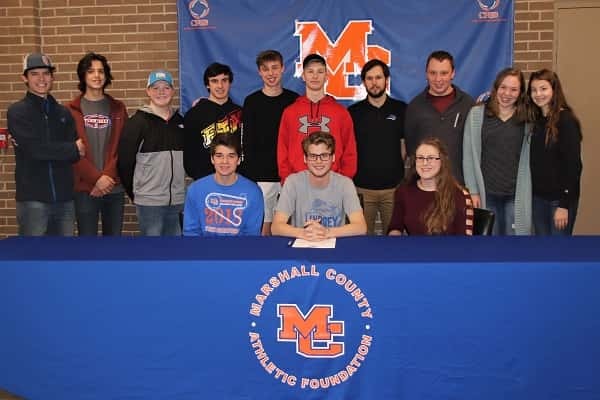 Several members of Grant’s family came to support him Thursday at his signing with Lindsey Wilson. Grant was joined by (L-R) Marshall County Mountain Bike Team Coach Steve Beckett, Lindsey Wilson Coach Josh Patton and Marshall County Mountain Bike Team Coach Jourdan Griffith. 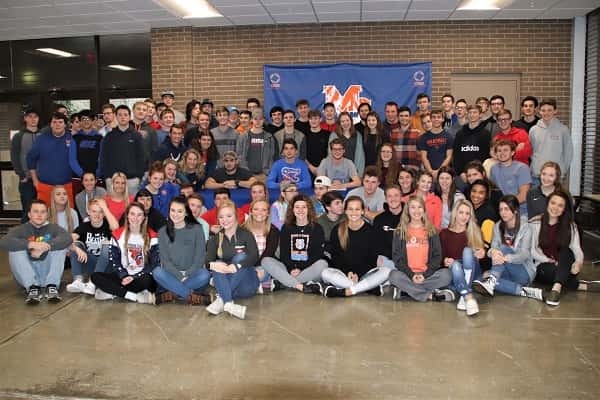 Members of the mountain bike team were there to support Grant on Thursday at his signing. Members of the track team and many friends were on hand to congratulate Grant on his signing.